Read by author Jamie Farr, with original music by Tim Clott. Jamie Farr’s dynamic reading is accompanied by original music by Tim Clott. Bonus song features original music and lyrics by Tim Clott, sung by Jamie Farr. Hababy’s Christmas Eve is an illustrated children’s Christmas story following the Three Wise Men as they travel to Bethlehem braving cold, thirst and sandstorms with the help of animal companions. Horses, goats, sheep and of course, camels play an important role in this telling of the great journey following the star in the East. Join Hababy and his friends on Christmas Eve as father camel, Habeebee relays the Christmas story from the point of view of the animals that journeyed with the Three Wise Men. 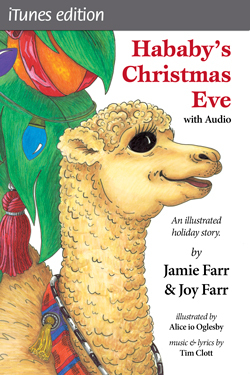 Jamie Farr (Klinger from M*A*S*H) and Joy Farr’s delightful holiday tale is perfect for children of all ages. Start a new holiday tradition this year with Hababy’s Christmas Eve. Jamie Farr a television, film, and theater actor is best known for having played the role of cross-dressing Corporal (later Sergeant) Maxwell Q. Klinger in the hit television sitcom M*A*S*H. Klinger’s character was well known for the series of stunts he pulled trying to convince everyone he was crazy. In season six, “Last Laugh” episode, Klinger pretends to be leading a camel named Habeebee around the M*A*S*H camp. “Whatever happened to Corporal Klinger’s imaginary camel?” Jamie Farr and his wife Joy have always loved children’s stories and their imaginations were sparked by this question. The result is Hababy’s Christmas Eve, a holiday story about Habeebee and his family — wife, Habeeba, son, Hababy and Hababy’s friends Adeeb the goat, Rebecca the lamb and Ali the horse. Engaging full-color illustrations throughout by Alice io Oglesby. Totally excited that my entry into the Spoonflower Design Challenge for making a Cat Damask was voted #1….